Grace your table with this traditional Colonial symbol of hospitality. Personalize it! For detailed information about engraving, please click the question mark. 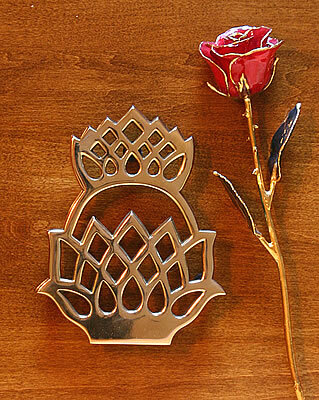 This traditional pineapple trivet is cast from solid brass in a beautiful design. This would be a lovely addition to any table or wall. The brass is lacquered to keep it shining. The pineapple trivet measures 6-1/2" by 5-1/4" and stands 1" high on three rubber covered feet. Weight: 14 ounces. This pineapple trivet not only looks good on the table but serves a very practical role for setting hot serving dishes on the table. I purchased this trivet for a new neighbor and was delighted with its quality. I''ve ordered this kind of trivet before from other companies but felt that this version of it surpassed others. It''s a bit smaller than I had anticipated, but the quality and packaging were excellent and classic. (It was very happily received by my new neighbors!) I''ll order it again in future. In Colonial times, the pineapple was the traditional symbol of hospitality. Now warm your home with this same Early American message. We also recommend the pineapple trivet as the perfect hostess gift. Ships in an elegant gift box.